Finish Rating — Min 20 min. 1. Wood Studs — Nom 2 by 4 in., spaced 24 in. OC max. Cross braced at mid-height and effectively firestopped at top and bottom of wall. No min. air space between stud rows except to accommodate attachment of sheathing, where required. See items 4 and 5. 2. Gypsum Board* — Any 5/8 in. thick UL Classified Gypsum Board that is eligible for use in Design Nos. L501, G512 or U305. Nom 5/8 in. thick 4 ft wide. Gypsum board applied horizontally or vertically, unless specified below, and nailed to studs and bearing plates 7 in. OC with 6d cement coated nails, 1-7/8 in. long, 0.0915 in. shank diam and 1/4 in. diam head. As an alternate, No. 6 bugle head drywall screws, 1-7/8 in. long, may be substituted for the 6d cement coated nails. When Steel Framing Members* (Item 6-6C) are used, wallboard attached to furring channels with 1 in. long Type S bugle-head steel screws spaced 12 in. OC. 2A. Gypsum Board* — (As an alternate to Item 2, not shown) — Nominal 5/8 in. thick, 4 ft wide panels, applied vertically to studs and bearing plates on one side of the assembly with 1-5/8 in. long Type S screws spaced 12 in. OC at perimeter of panels and 8 in. OC in the field. Horizontal joints of vertically applied panels need not be backed by studs. Panel joints covered with paper tape and two layers of joint compound. Screwheads covered with two layers of joint compound. Batts and Blankets placed in stud cavity as described in Item 5C. Not evaluated for use with Steel Framing Members, Furring Channels or Fiber, Sprayed. PABCO BUILDING PRODUCTS L L C, DBA PABCO GYPSUM — Type QuietRock QR-530 (finish rating 23 min). 2B. Gypsum Board* — (As an alternate to Item 2, not shown) — Any 5/8 in. thick gypsum panels that are eligible for use in Design Nos. L501, G512 or U305, supplied by the Classified companies listed below shown in the Gypsum Board* (CKNX) category. Applied horizontally or vertically and attached to studs and bearing plates with 1-1/4 in. long Type W coarse thread gypsum panel steel screws spaced a max 8 in. OC, with last screw 1 in. from edge of board. When used in widths other than 48 in., gypsum board to be installed horizontally. 2C. Gypsum Board* — (As an alternate to Item 2, Not Shown) — 5/8 in. thick gypsum panels applied horizontally or vertically and attached to studs and bearing plates with 1-1/4 in. long Type W coarse thread gypsum panel steel screws spaced a max 8 in. OC, with last screw 1 in. from edge of board. When used in widths other than 48 in., gypsum board to be installed horizontally. 2D. Gypsum Board* — (As an alternate to Items 2, 2A, 2B and 2C) — 5/8 in. thick gypsum panels, with square edges, applied either horizontally or vertically. Gypsum panels fastened to framing with 1-1/4 in. long Type W coarse thread gypsum panel steel screws spaced a max 8 in. OC, with last 2 screws 1 and 4 in. from edge of board or nailed as described in Item 2. When used in widths of other than 48 in., gypsum boards are to be installed horizontally. 2E. Gypsum Board* — (As an alternate to Items 2 through 2D) — 5/8 in. thick, 4 ft. wide, paper surfaced applied vertically only and secured as described in Item 2. 2F. Gypsum Board* — (As an alternate to Items 2 through 2E) - Installed as described in Item 2. 5/8 in. thick, 4 ft. wide, paper surfaced, applied vertically only and fastened to the studs and plates with 6d cement coated nails 1-7/8 in. long, 0.0915 in. shank diam and 1/4 in. diam heads, 7 in. OC. Not for use with item #6. 2G. Gypsum Board* — (As an alternate to Items 2 through 2F) — Nominal 5/8 in. thick, 4 ft wide panels, applied vertically and secured as described in Item 2. 2H. Gypsum Board* — (As an alternate to Items 2 through 2G) — Installed as described in Item 2. 5/8 in. thick, 4 ft. wide, paper surfaced, applied vertically or horizontally fastened to the studs and plates with 1-1/4 in. long Type W coarse thread gypsum panel steel screws spaced a max 8 in. OC, with last screw 1 in. from edge of board. 2I. Wall and Partition Facings and Accessories* — (As an alternate to Items 2 through 2H) — Nominal 5/8 in. thick, 4 ft wide panels, applied vertically and secured as described in Item 2. 2J. Gypsum Board* — (As an alternate to 5/8 in. Type FSW in Item 2) — 2 layers nom. 5/16 in. thick gypsum panels applied vertically or horizontally. Horizontal joints on the same side need not be staggered. Inner layer attached with fasteners, as described in item 2, spaced 24 in. OC. Outer layer attached per Item 2. 2K. Gypsum Board* — (As an alternate to Item 2) — 5/8 in. thick gypsum panels, with beveled, square, or tapered edges, applied either horizontally or vertically. Gypsum panels fastened to framing with 1-1/4 in. long Type W coarse thread gypsum panel steel screws spaced a maximum 10 in. OC with the last two screws 4 and 1 in. from the edges of the board. When used in widths other than 48 in., gypsum panels are to be installed horizontally. 3. Joints and Nailheads — Gypsum board joints of outer layer covered with tape and joint compound. Nail heads of outer layer covered with joint compound. As an alternate, nom 3/32 in. thick gypsum veneer plaster may be applied to the entire surface of Classified veneer baseboard with joints reinforced with paper tape. 4. Sheathing — (Optional) — Septum may be sheathed with min 7/16 in. thick wood structural panels min grade "C-D" or "Sheathing" or min 1/2 in. thick Mineral and Fiber Boards*. See Mineral and Fiber Boards (CERZ) category for names of Classified companies. 5. Batts and Blankets* — 3-1/2 in. max thickness glass or mineral fiber batt insulation. Optional when sheathing (Item 4) is used on both halves of wall. See Batts and Blankets (BZJZ) category for list of Classified companies. 5A. Fiber, Sprayed* — As an alternate to Batts and Blankets (Item 5) — Spray applied cellulose material. The fiber is applied with water to completely fill the enclosed cavity in accordance with the application instructions supplied with the product with a nominal dry density of 2.7 lb/ft3. Alternate Application Method: The fiber is applied without water or adhesive at a nominal dry density of 3.5 lb/ft3, in accordance with the application instructions supplied with the product. 5B. Fiber, Sprayed* — As an alternate to Batts and Blankets (Item 5) when Sheathing (Item 4) is used on both halves of wall - Spray applied cellulose insulation material. The fiber is applied with water to interior surfaces in accordance with the application instructions supplied with the product. Applied to completely fill the enclosed cavity. Minimum dry density of 4.3 pounds per cubic ft.
5C. Batts and Blankets* — (Required for use with Wall and Partition Facings and Accessories, Item 2A. Use of Sheathing, Item 4, does not nullify requirement of Item 5C for use with Item 2A) — Glass fiber insulation, nom 3-1/2 in. thick, min. density of 0.80 pcf, with a flame spread of 25 or less and a smoke developed of 50 or less, friction-fitted to completely fill the stud cavities. See Batts and Blankets Category (BKNV) for names of manufacturers. 5D. Fiber, Sprayed* — As an alternate to Batts and Blankets (Item 5) and Item 5A when Sheathing (Item 4) is used on both halves of wall - Spray applied cellulose fiber. The fiber is applied with water to completely fill the enclosed cavity in accordance with the application instructions supplied with the product. The minimum dry density shall be 4.30 lbs/ft3. 5E. Fiber, Sprayed* — As an alternate to Batts and Blankets (Item 5) - Spray-applied cellulose material. The fiber is applied with water to completely fill the enclosed cavity in accordance with the application instructions supplied with the product. To facilitate the installation of the material, any thin, woven or non-woven netting may be attached by any means possible to the outer face the studs. The material shall reach equilibrium moisture content before the installation of materials on either face of the studs. The minimum dry density shall be 5.79 lbs/ft3. A. Furring Channels — Formed of No. 25 MSG galv steel. 2-9/16 in. or 2-23/32 in. wide by 7/8 in. deep, spaced 24 in. OC perpendicular to studs. Channels secured to studs as described in Item b. Ends of adjoining channels are overlapped 6 in. and tied together with double strand of No. 18 SWG galv steel wire near each end of overlap. As an alternate, ends of adjoining channels may be overlapped 6 in. and secured together with two self-tapping #6 framing screws, min. 7/16 in. long at the midpoint of the overlap, with one screw on each flange of the channel. Wallboard attached to furring channels as described in Item 2. B. Steel Framing Members* — Used to attach furring channels (Item a) to studs (Item 1) . Clips spaced 48 in. OC., and secured to studs with No. 8 x 2-1/2 in. coarse drywall screw through the center grommet. Furring channels are friction fitted into clips. RSIC-1 clip for use with 2-9/16 in. wide furring channels. RSIC-1 (2.75) clip for use with 2-23/32 in. wide furring channels. a. Furring Channels — Formed of No. 25 MSG galv steel. 2-3/8 in. wide by 7/8 in. deep, spaced 24 in. OC perpendicular to studs. Channels secured to studs as described in Item b. Ends of adjoining channels are overlapped 6 in. and tied together with double strand of No. 18 SWG galv steel wire near each end of overlap. As an alternate, ends of adjoining channels may be overlapped 6 in. and secured together with two self-tapping #6 framing screws, min. 7/16 in. long at the midpoint of the overlap, with one screw on each flange of the channel. 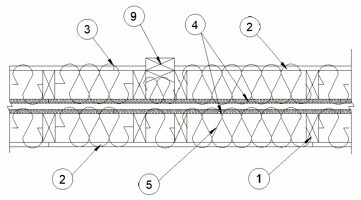 Gypsum board attached to furring channels as described in Item 2.
b. Steel Framing Members* — Used to attach furring channels (Item a) to studs. Clips spaced 48 in. OC. Genie clips secured to studs with No. 8 x 1-1/2 in. coarse drywall screw through the center hole. Furring channels are friction fitted into clips. a. Furring Channels — Formed of No. 25 MSG galv steel. Spaced 24 in. OC perpendicular to studs. Channels secured to studs as described in Item b. Ends of adjoining channels overlapped 6 in. and tied together with double strand of No. 18 AWG galvanized steel wire. Gypsum board attached to furring channels as described in Item 2.
b. Steel Framing Members* — Used to attach furring channels (Item 6Ba) to studs. Clips spaced 48 in. OC., and secured to studs with 2 in. coarse drywall screw with 1 in. diam washer through the center hole. Furring channels are friction fitted into clips. A. Furring Channels — Formed of No. 25 MSG galv steel. Spaced 24 in. OC perpendicular to studs. Channels secured to studs as described in Item 6Cb. Ends of adjoining channels overlapped 6 in. and tied together with double strand of No. 18 AWG galvanized steel wire. Gypsum board attached to furring channels as described in Item 2. B. Steel Framing Members* — Used to attach furring channels (Item 6CA) to studs. Clips spaced 48 in. OC., and secured to studs with No. 8 x 2-1/2 in. coarse drywall screw through the center hole. Furring channels are friction fitted into clips. a. Resilient Channels — Formed of No. 25 MSG galv steel, spaced 24 in. OC, and perpendicular to studs. Channels secured to studs as described in Item b. Ends of adjoining channels overlapped 6 in. and secured in place with two No. 8 15 x 1/2 in. Philips Modified Truss screws spaced 2-1/2 in. from the center of the overlap. Gypsum board attached to resilient channels as described in Item 2.
b. Steel Framing Members* — Used to attach resilient channels (Item 6Da) to studs. Clips spaced 48 in. OC., and secured to studs with No. 8 x 2-1/2 in. coarse drywall screw through the center hole. Resilient channels are secured to clips with one No. 10 x 1/2 in. pan-head self-drilling screw. 7. Wall and Partition Facings and Accessories* — (Optional, Not shown) — Nominal 1/2 in. thick, 4 ft wide panels, for optional use as an additional layer on one or both sides of the assembly. Panels attached in accordance with manufacturer's recommendations. When the QR-500 or QR-510 panel is installed between the wood framing and the UL Classified gypsum board, the required UL Classified gypsum board layer(s) is/are to be installed as indicated as to fastener type and spacing, except that the required fastener length shall be increased by a minimum of 1/2 in. Not evaluated or intended as a substitute for the required layer(s) of UL Classified Gypsum Board. 8. Mineral and Fiber Board* — ((Optional, Not Shown) — For optional use as an additional layer on one or both sides of wall. Nom 1/2 in. thick, 4 ft wide with long dimension parallel and centered over studs. Attached to framing as described in Item 2. The required UL Classified gypsum board layer(s) is/are to be installed as indicated as to fastener type and spacing, except that the required fastener length shall be increased by a minimum of 1/2 in. Not evaluated or intended as a substitute for the required layer(s) of UL Classified Gypsum Board. 9. Non-Bearing Wall Partition Intersection — (Optional) — Two nominal 2 by 4 in. stud or nominal 2 by 6 in. stud nailed together with two 3in. long 10d nails spaced a max. 16 in. OC. vertically and fastened to one side of the minimum 2 by 4 in. stud with 3 in. long 10d nails spaced a max 16 in. OC. vertically. Intersection between partition wood studs to be flush with the 2 by 4 in. studs. The wall partition wood studs are to be framed by with a second 2 by 4 in. wood stud fastened with 3 in. long 10d nails spaced a max. 16 in. OC. vertically. Maximum one non-bearing wall partition intersection per stud cavity. Non-bearing wall partition stud depth shall be at a minimum equal to the depth of the bearing wall. (Optional, Not Shown) Alternate Construction For Use On One Side Of The Wall. 10. Mineral and Fiber Board* — For use with Items 10A-10D) —Nom 1/2 in. thick, 4 ft wide with long dimension parallel and centered over studs. Attached to framing with minimum 1-3/8 in. long ring shanked nails or 1-1/4 in. long Type W steel screws, spaced 12 in. OC along board edges and 24 in. OC in field of board along intermediate framing. Not evaluated or intended as a substitute for the required layer(s) of UL Classified Gypsum Board. 10A. Glass Fiber Insulation — (For use with Item 10) — 3-1/2 in. thick glass fiber batts bearing the UL Classification Marking as to Surface Burning and/or Fire Resistance, placed to fill the interior of the wall. See Batts and Blankets (BKNV or BZJZ) categories for names of Classified companies. 10B. Batts and Blankets* — (As an alternate to Item 10B, For use with Item 10), 3 in. thick mineral wool batts, placed to fill interior of wall, attached to the 3-1/2 in. face of the studs with staples placed 24 in. OC. 10C. Adhesive — (For use with Item 10) — Construction grade adhesive applied in vertical, serpentine, nominal 3/8 in. wide beads down the length of both vertical edges of Mineral and Fiber Board (Item 14A). 10D. Gypsum Board* — (For use with Item 10) — 5/8 in. thick, 4 ft wide, applied vertically over Mineral and Fiber Board (Item 14A) with vertical joints located anywhere over stud cavities. Secured to mineral and fiber boards with 1-1/2 in. Type G Screws spaced 8 in. OC along edges of each vertical joint and 12 in. OC in intermediate field of the Mineral and Fiber Board (Item 10). Secured to outermost studs and bearing plates with 2 in. long Type S screws spaced 8 in. OC. Gypsum Board joints covered with paper tape and joint compound. Screw heads covered with joint compound. Finish Rating 30 Min.